We report on the assembly of tumor necrosis factor receptor 1 (TNF-R1) prior to ligand activation and its ligand-induced reorganization at the cell membrane. We apply single-molecule localization microscopy to obtain quantitative information on receptor cluster sizes and copy numbers. Our data suggest a dimeric pre-assembly of TNF-R1, as well as receptor reorganization toward higher oligomeric states with stable populations comprising three to six TNF-R1. Our experimental results directly serve as input parameters for computational modeling of the ligand–receptor interaction. Simulations corroborate the experimental finding of higher-order oligomeric states. 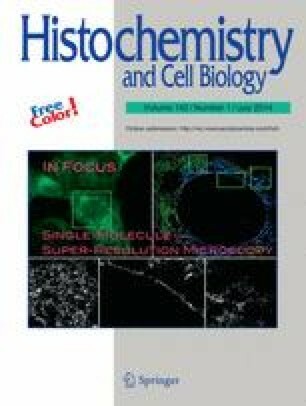 This work is a first demonstration how quantitative, super-resolution and advanced microscopy can be used for systems biology approaches at the single-molecule and single-cell level. Franziska Fricke and Sebastian Malkusch have contributed equally. The online version of this article (doi: 10.1007/s00418-014-1195-0) contains supplementary material, which is available to authorized users. We thank Markus Braner for help with microscale thermophoresis measurements. M. Heilemann, F. Fricke and S. Malkusch acknowledge the financial support by the German Ministry of Education and Research (BMBF, Grant 336314) and the cluster of excellence “Macromolecular Complexes” (CEF, DFG cluster of excellence (EXC 115)). T. Dandekar and G. Wangorsch acknowledge the financial support by the German Science Foundation (DFG, Da 208/12-1 and SFB688/A2). D. Widera, C. Kaltschmidt, B. Kaltschmidt and J. Greiner were supported by the BMBF and Cassella Med, Cologne.